My daughters gave me this above ground garden last year for Mother's Day. My hubby had it assembled, and it's been sitting this whole time...empty and lonely. I decided it was time to do my research and figure out what can be planted this time of year that will do well in our very hot Texas summers. Thank you Miz. Helen for all your help! Hubby bought all the good soil, compost, and manure stuff and got my garden ready for some transplants. 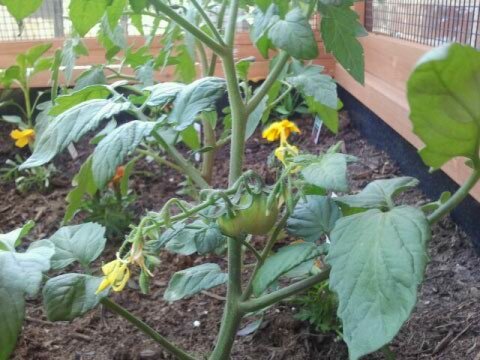 The garden is now full of a variety of tomatoes, jalapenos, cayenne peppers, sweet peppers, and banana peppers. This is my garden during week 1. ﻿My mom brought me some herbs for my birthday. I decided to plant these in pretty pots next to my garden. I have sweet thyme, oregano, and rosemary. In the front left pot, I planted green onion seeds. In the front right pot, I planted garlic cloves. I noticed a couple of the plants had holes in the leaves, which probably means a bug or insect is snacking on them. I planted some marigolds today which are supposed to keep bugs away. They are stinky little flowers, but add some color to the garden. 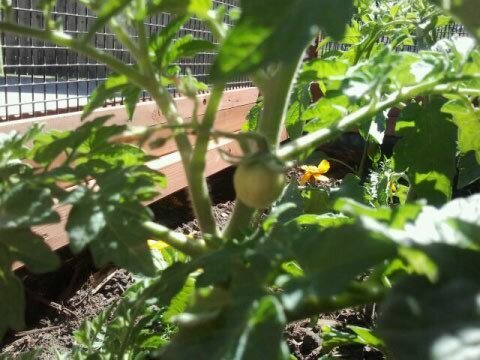 It's been a full week and two of the tomato plants have little green tomatoes on them...3 tomatoes total! I was so thrilled this afternoon when I saw them! It absolutely made my day. Let me just confess that my hubby took over caring for our indoor plants years ago after I kept killing them. Now, I'm a determined newbie gardener. If I do well with this garden, we might till up some of our yard for a much larger garden and attempt to grow several other fruits and vegetables. Wish me luck with this little garden first! This little area is next to our side entry garage. I want to put a little picket fence around the area and add a bench and small table. I might even add some potted flowers for some color. My kids like playing basketball, rollerskating, riding their bikes, and playing hopscotch in our driveway. This would be the perfect area for me to sit and enjoy watching my kids have fun while sipping on some sweet iced tea. A perfect culinary garden! I have to wait at least two more months to put my tomatoes in! My garlic is just coming up! Love it! Oh that is a gorgeous garden box. You have a lovely garden! It really is satisfying to harvest your own veggies right into your cooking pot! Hope that you plants will grow healthy and give you lots of harvest! Happy Gardening! I love your little garden! You did good girl! You really got a lot of goodies in that space. That is a great garden box. Your tomatoes look good. I planted some merigolds around to keep the rabbits and other little creatures away, you're right they don't smell very good. I am excited to keep up with your Garden Journey. Love this garden. Just found your wonderful blog and am a new follower! Yeah little but very nice. Its the best good garden in short. It provides me lots of pleasure and encourage me to make a Symcorp Home Extension Builder garden.!! Nice and effective post.